Residents of ShantiNiketan, a retirement community near Orlando, Fla., walk in a Hindu religious procession. Iggy Ignatius speaks at a meeting in California in November 2014. The ShantiNiketan retirement complex provides residents with Indian food and cultural experiences. Iggy Ignatius was born in India. Even though he moved to the States in his 20s, he still felt that India was the place he belonged. He always thought he'd retire there. But when the time approached, there was a problem. "My daughters, my son, my grandchildren are all like chains that do not allow you to leave for India," Ignatius says. He couldn't imagine leaving them to go to the place he belonged. He was torn. And then one day it hit him. 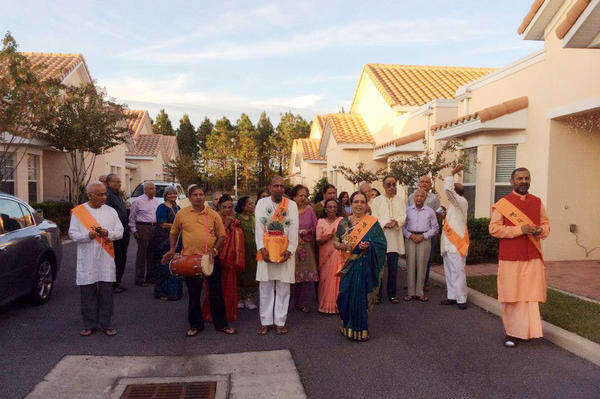 What if he built an Indian retirement community — in Florida? It would look just like an Indian village, with low buildings and a big courtyard. There would be palm trees. Greenery. He'd serve Indian food — curry, rice, homemade yogurt. There would be yoga. Bollywood movies. But most of all, other Indians. Looking around ShantiNiketan, the community in Tavares, Fla., that Ignatius created, you'd never know you weren't in India. He started the project in August 2008. And just one month later, the stock market crashed. Iggy thought ShantiNiketan was doomed. He was trying to sell two-bedroom condos for $130,000, and across the street you could get a four-bedroom, single-family house for $100,000. But, it turned out, the fact that Florida was in the worst housing crisis in the history of the state was not a problem at all. He sold out an entire wing of condos instantly. That got us wondering, what had Iggy tapped into? What human impulse is more compelling than money? "It's a gated community where you will be living with people of your own cultural background," Iggy says in one of the YouTube advertisements for the complex. So I went down to Florida to find out if the people had bought out of some primal desire to stick with their own. And if so, was that OK? What if you flipped this and this is like one of those country clubs that only let in white men? That comparison is unfair, Ignatius says. "We would let anybody in." But no one at ShantiNiketan was shy about admitting that part of what everyone was paying for was being around people like them. "My God, Lulu, the happiness they give me," said one resident, Vijaya Garimella. "Very, very nice people are here; very, very nice people." It can be exhausting to live in a culture as an outsider, Garimella and others say, a place where people don't understand your accent or your beliefs. "You know I would dread to go through the drive-through to even buy a cup of coffee," Ignatius says, "because when I ask her for a coffee, she just wouldn't understand. 'What? What do you want?' "
So the return to a community of people just like you is a relief. "Life is just better here," Garimella says. But there's a dark side to this homogenous heaven, its founder says. "I don't want my children or grandchildren to live in a community like this," Ignatius says. "Retirement communities are places where people go waiting to die." And at that time, he thinks, it's beyond your control. No matter who you are, you'll experience a deep primal desire to withdraw, like a salmon swimming upstream to the place of its birth to spawn and die. "I think that is an animal instinct which we as human beings seem to have." Iggy is absolutely right, according to Jeff Greenberg, a professor of psychology at the University of Arizona. If you raise the specter of death in a person's mind, he says, Christians like Christians better; Italians like Italians better. Even Germans, who are usually pretty lukewarm about other Germans, if you get them to contemplate their own mortality, suddenly they really like Germans. "If you interview Germans near a funeral home, they're much more nationalistic," Greenberg says. And the reverse is also true: We like people outside our group much, much less. "People become more negative toward other cultures," Greenberg says. "Because death haunts us as it does, we have to do something about it." Greenberg thinks that in this odd way we try to fend off death. He figures that people who are not in your group in some very primal way make you feel invisible. That's unpleasant at any stage of life, but particularly so when the threat of disappearing is so real. "And so to manage the terror that we're just these transient creatures," Greenberg says, we shoo away those people who make us disappear. When we dive deep into our own category, what Greenberg thinks we're actually getting is the lovely illusion that we're significant, and we're enduringly significant. This week's episode of Invisibilia, NPR's new show about human behavior, explores the idea of categories and how they influence our choices in life. You can hear the program on many public radio stations this weekend. The podcast is available for download on NPR.org and on iTunes. People are willing to pay above market rates to live among others who share the same cultural background. And we're about to hear why in this latest story from NPR's new show about human behavior, INIVISIBILIA. Here's co-host Lulu Miller. LULU MILLER, BYLINE: Iggy Ignatius was born in India, and even after he moved to the states in his 20s, felt that India was the place he belonged. He always figured that when he retired he would return. But once retirement came, there was a problem. IGGY IGNATIUS: My daughters, my son, my grandchildren, are all like chains that does not allow you to go back to India. 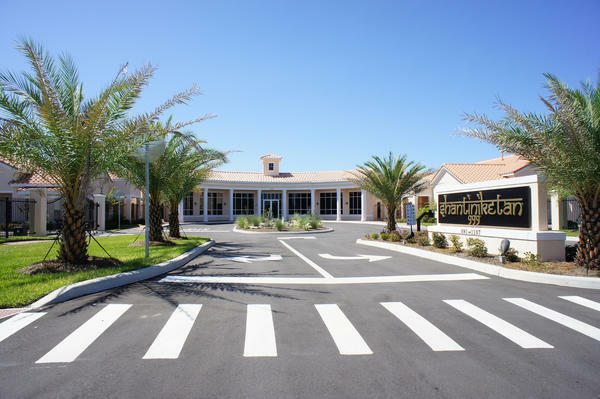 IGNATIUS: An Indian retirement community in Florida. >>MILLER. He'd serve Indian food. IGNATIUS: Curry, rice, homemade yogurt. MILLER: ...You weren't in India. MILLER: So we came up with a name for his plan - Shantiniketan. He found 10 investors, and, in August of 2008, he met with them all down in Florida, right near the site where he planned to build. IGNATIUS: I still remember the date - August 2, 2008, verybody handed me down there check. UNIDENTIFIED WOMAN: You know what? Right now, breaking news here - stocks all around the world are tanking because of the crisis on Wall Street. MILLER: You may recall September 2008, the worst financial crisis since the Great Depression. IGNATIUS: My biggest challenge was, across the street, you could buy a four bedroom home for $100,000, and I was selling here for $130,000, a two bedroom condo, half the size of what you could get across the street for $100,000. MILLER: But it turned out that the fact that Florida was in the worst housing crisis in the history of the state, was not a problem at all. Instantly, he sold out an entire wing of condos. IGNATIUS: I had enough money to build two wings. IGNATIUS: And it was still the worst market in the real estate going on in Florida. Which raises the question, what had Iggy tapped in to? MILLER: This is sound from one of his YouTube ads. Like, what human impulse is more compelling than money? IGNATIUS: And there will be gates here and here, and the whole property will be fenced. MILLER: So I went down to Florida to ask Iggy and the people who had actually bought homes in Shantiniketan. IGNATIUS: Hello. Oh my goodness. MILLER: Had they purchased that primal desire to stick with your own? And, if so, was that, you know, okay? What if you flipped this? You know, like, what if this was one of these country clubs that only lets in white men. Like the Augusta National Golf Club which, until the '90s, did not let in black members. IGNATIUS: Your comparison to a Georgia country club is not fair. MILLER: Everybody pointed out that they are not excluding anyone. IGNATIUS: We would let anybody in. MILLER: But no one was shy about admitting that part of what they were paying for was being around people like them. 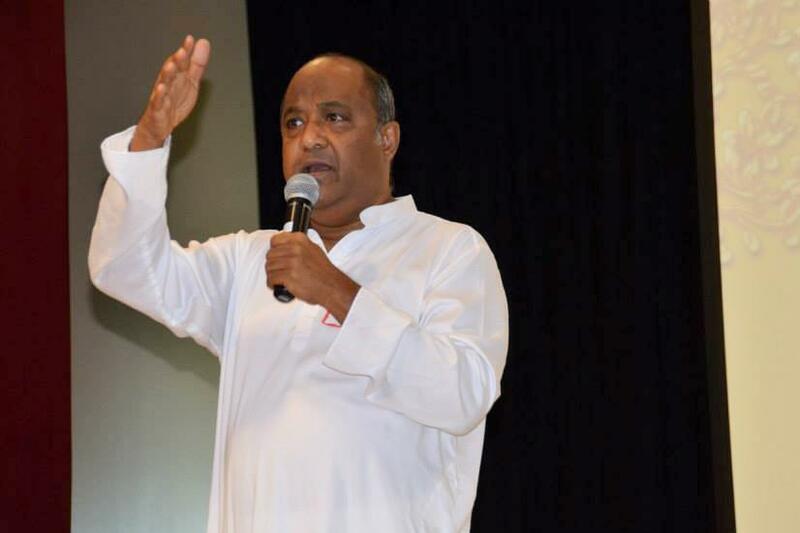 VIJAYA GARIMELLA: My God, Lulu, the happiness it gives me. GARIMELLA: Very, very nice people are here. Very, very nice people. MILLER: Vijaya, sorry about that. Vijaya Garimella said, just think about what it is like to spend decades in a country where people always have trouble understanding your accent or your beliefs or your history. IGNATIUS: For example, you know, I would dread to go through a drive-through to even buy a cup of coffee. IGNATIUS: Because when I ask her for a coffee she just wouldn't understand. MILLER: So the return to a community of people just like you is a relief. GARIMELLA: Life just goes better here. MILLER: But is there a dark side to this homogenous heaven? Iggy says yes. IGNATIUS: I don't want my children or grandchildren to live in a community like this. MILLER: He says it's too insular. IGNATIUS: But retirement communities are places where people go waiting to die. MILLER: And according to Iggy, at that time, it is beyond your control. No matter who you are, you will experience a deep primal desire to withdraw. IGNATIUS: Look at the salmon. The salmon always swims upstream to the place of its birth to spawn and then die there. And I think that is an animal instinct which we, as human beings, seem to have that aspect of us inert. MILLER: So is that true? Is it just animal nature to get a little racist as death approaches? MILLER: This is Doctor Jeff Greenberg, who's been studying how we behave when death is on the mind for over three decades. GREENBERG: Professor of psychology at the University of Arizona. MILLER: And he says that Iggy is absolutely right. If you raise the specter of death in a person's mind, Christians like Christians better, Italians like Italians better and Germans - who most of the time are actually pretty lukewarm on other Germans. GREENBERG: I think it's lingering, you know, guilt. MILLER: If you get them to contemplate their own mortality, suddenly they really like Germans. GREENBERG: So if you interview Germans near a funeral home, they're much more nationalistic (laughter). MILLER: But it's not just that we like our own more. Its reverse imprint is also true. We like people outside of our group much, much less. GREENBERG: People become more negative toward other cultures. GREENBERG: Well, because death haunts us as it does. We have to do something about it. MILLER: Jeff Greenberg thinks it may be this odd way we try to fend off death. Because he figures that people who aren't in your group, in some very primal way, it's like they make you feel invisible. IGNATIUS: I would dread to go through a drive-through to even buy a cup of coffee. MILLER: Which is unpleasant at any stage in your life, but particularly when the threat of disappearing is so real. MILLER: We shoo those people who make us disappear away. GREENBERG: That we're significant. And we're enduringly significant. SIEGEL: Lulu Miller co-hosts NPR's new program, INIVISIBILIA. You can hear it on many public radio stations this weekend. The podcast is at npr.org and on itunes.com/npr. Transcript provided by NPR, Copyright NPR.